The glacially derived aquifer systems of southeastern Massachusetts compose the largest groundwater reservoir in the State. Population increases, land-use changes, and climate change in this area could lead to three primary environmental effects that relate directly to groundwater resources—(1) increases in pumping that could adversely affect environmentally sensitive groundwater-fed surface waters, such as ponds, streams, and wetlands; (2) changes in land use that could affect the quality of water in the aquifer; and (3) changes in precipitation and mean sea level that can affect water levels, streamflow, and the position of the freshwater/saltwater boundary. Therefore, understanding groundwater flow and the factors that can affect it is critical to managing and protecting this vital resource. 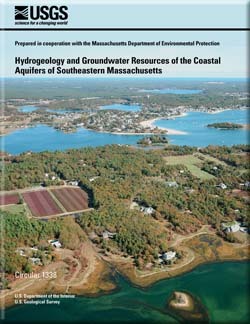 Masterson, J.P., and Walter, D.A., 2009, Hydrogeology and groundwater resources of the coastal aquifers of southeastern Massachusetts: U.S. Geological Survey Circular 1338, 16 p.